As an independent electrical wholesaler we have been selected to be part of the nationally recognised and respected purchasing consortium, AWEBB. As a member of AWEBB we use our combined buying power to negotiate deals and competitive discounts with our electrical suppliers across the wide range of products available in the industry. 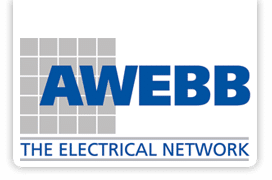 AWEBB has operated for over 36 years giving its members the best commercial agreements it is possible to get with brands such as Crabtree, Dextra, Wylex, Hager, Thorn, AEI Cables, Draka, Copper Lighting, Schneider and Osram. Collectively the AWEBB network has over 190 branches and employs over 900 staff and we are partnered right throughout Europe with likeminded wholesalers taking the overall turnover to 4.5 billion pounds. Rayton Electrical, as a member of AWEBB, has access to Electracentre Distribution which means we have an additional 10,0000 square feet of warehouse space holding thousands of products relevant to the successful day to day running of an electrical wholesaler. Rayton has the purchasing power to give you the best prices for your electrical supplies and access to a massive distribution network to deliver your orders where you need them. We can buy electrical products at scale and pass on the discounts to our customers. If you are working away from base you have the conveneince of visiting any of the 190 branches across the country. As well as our own brands we supply all industry standard brands ensuring you get high quality products. Our excellent levels of personal customer service is extend across our nationwide distribution network. The double booking system means that wherever you are in the country, if you hold an account with us, you can use your account at any of the 190 branches. Members share industry knowledge of new products and innovations so that we can help you with your projects.